On a muggy summer’s afternoon in 614 a ship, the Praenuntius, emerged from a thunderstorm off the Caladian village of Pescina. The ship was such a shambles of splintered timbers and rotten lines that the fishermen who first saw her were shocked she was still afloat. When they hailed her they received no reply from the grimly mute derelict. A stench of death hung all about her. Although her sails were torn almost to shreds, they still caught enough of the storm’s warm breeze to carry her ashore on Pescina’s sandy beach. The villagers swarmed down to see her, eager to find out what strange fate had befallen the vessel and its crew. More shouted questions went unanswered. There was no sign of movement aboard. A vast flock of gulls circled the ship. The village priest begged the townsfolk to burn the ill omened ship were she lay, but Pescina was a brutally poor village and the prospect of the salvage was too tempting. A group of young lads soon climbed aboard. The fools had barely set foot on the deck when they realised their terrible mistake. The crew were strewn about the ship, contorted in death, their corpses black and bloated with plague. The men fled, but they were far, far too late. The Blackwing Plague had come to Circilia. Within the week a fifth of Pescina’s population had died in screaming agony. Within month all Caladia was engulfed. By the end of summer the disease had even reached distant Ivanstir. Strangely the disease also infected many flying creatures and by the end of 615 even the mighty, seemingly invincible, dragons had fallen to the plague. Circilia would never be the same. 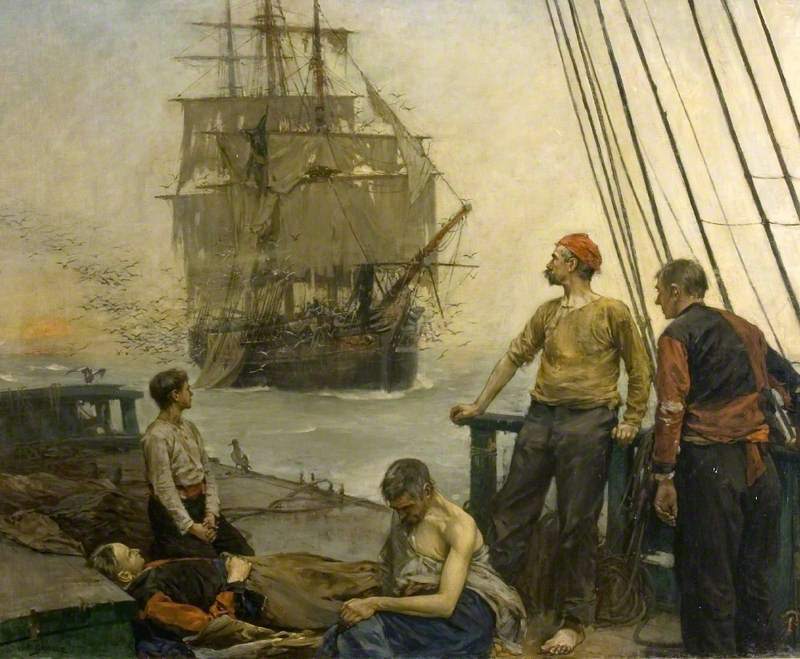 This superb painting is “The Plague Ship” by Bernard Gribble. (c) Nick R. Gribble. thanks a lot that was a awesome entertaining posting, tons of problems in the earth these times, and most we Sheeps do – is hunting what the super stars do, just like , despite the fact that we alaetnrtively should focus on what is going on in the world, it converts out to become a prison earth unless we start out fighthing for our rights back! The question isn’t clearly defined.But I think what they’re looking for is this.With his 1 rmb, he purchases 2 kg of wheat in CHina.Then he come to America and sells those 2kg for 3 rmb.So he spends 1 rmb to get 3 rmb, hence a net profit of 2 rmb.Of course you have to consider the cost to get to America from China. Whatever.